I think this might have been the first time I used purchased shortbread cookies to make a crust (as opposed to graham crackers or chocolate or ginger cookie crumbs) and I love the way they work. To make the shortbread cookie crumbs for the crust, seal the cookies in a heavy plastic bag and use a rolling pin to crush them into fine crumbs. This is a light textured, pretty cake. 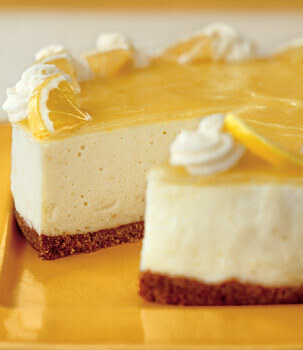 Perfect for a baby or wedding shower or anytime you want something lemony and creamy. Bon Appetit chose to show the cake with simple slices of fresh lemon. If you would like to candy them, as I had originally written the recipe, see the Candied Lemon recipe and directions at the end. I once decorated it with candied violets, which is another option. They can be found through India Tree. Position rack in middle of oven. Preheat oven to 350°F. Spray bottom of 8-inch-diameter springform pan with nonstick spray. Blend cookie crumbs and butter in small bowl. Press onto bottom of pan. Bake until golden, about 15 minutes. Cool. Pour 5 tablespoons water into small saucepan. Sprinkle gelatin evenly over. Let stand until gelatin softens, about 15 minutes. Meanwhile, place 1 3/4 cups lemon curd in large bowl. Stir 3/4 cup curd in another small saucepan over medium-low heat until very warm. Stir gelatin mixture over medium-low heat until dissolved and liquid is clear (do not boil). Whisk warm gelatin mixture into 3/4 cup warm curd. Gradually whisk gelatin-curd mixture into curd in large bowl. Using electric mixer, beat egg whites in medium bowl until soft peaks form. Gradually add sugar, beating until whites are thick and glossy. Fold whites into curd mixture in 3 additions. Using same beaters, beat cream in another medium bowl until peaks form. Fold into egg white-curd mixture in 3 additions. Pour enough mousse over cooled crust to fill pan completely. Pour remaining mousse into small bowl and reserve. Cover and chill mousse cake, reserved mousse, and remaining curd overnight. Arrange lemon slices between rosettes. Cut cake into wedges. FOR CANDIED LEMONS: Stir sugar and water together in a small saucepan. Bring to a boil over medium-high heat and cook until sugar dissolves, about 2 minutes. Meanwhile, slice lemons 1/4-inch thick, removing any seeds. Add lemon slices to simmering syrup and cook about 5 minutes or until the skin is tender and the flesh is just turning translucent. Let lemons cool in syrup. (May be made 1 week ahead and refrigerated in airtight container). To serve, quarter two or three of the best lemon slices and arrange as described in recipe.